Come help us kick off the 2019 season! 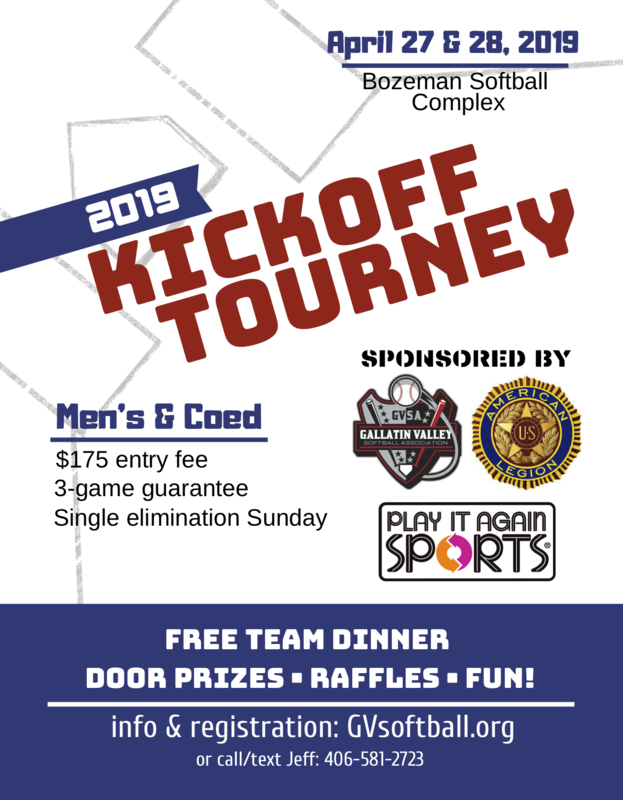 Games Run from 9:00 am to 5:15 pm on Saturday, Free team dinner and prizes at American Legion (225 E Main St, Bozeman) from 6:00 pm to 9:00 pm. Door prizes drawn at 7:00 pm at the American Legion. Rainout: The umpires on the field will determine if there is sufficient danger, either from lightning or unsafe field conditions to call a game. If Saturday game has played 3 full innings, the game will count towards seeding. If other games are not able to be played. If bracket games are not able to finish, trophies will be awarded to highest seed. Bat Raffle tickets available throughout the tournament. Drawing will be held before the first championship game. One ticket for $5, four tickets for $20. Do not need to be present to win, will ship out of town if necessary. Team rosters will need to be turned in by 3:00 pm Saturday. Sunday games, only rostered players can play. Co-ed can bat 10,12, or 14 players, Men's can bat 10,11,or 12. Home team will be decided by coin toss at the beginning of the game, and will keep official book. Report scores to the headquarters/Play It Again Sports tent. A player may be ejected from the game for unsportsmanlike conduct, at the discretion of the Umpire. An ejected player must leave that field area the game is being played. Upon a second offense, the ejected player must leave the softball complex for the remainder of the tournament. A player can also be made ineligible if the umpire deems them too intoxicated to play.